Why do we refer to the clients at Bridgehaven as MEMBERS? At Bridgehaven, our clients are participants in their own recovery and are members of the team that makes our rehabilitation and recovery services such a success. These services are person-centered and the Bridgehaven members play an active role in the program development to meet the needs of each and every individual attending. Members are also encouraged to advocate on local, state, and national levels in support of eradicating the stigma associated with mental illness. Bridgehaven members come here with a variety of diagnoses, including Schizophrenia (25%), Schizoaffective Disorder (22%), Depression (24%), Bipolar Disorder (Manic-Depressive) (20%), and Psychotic or other disorders (8%). 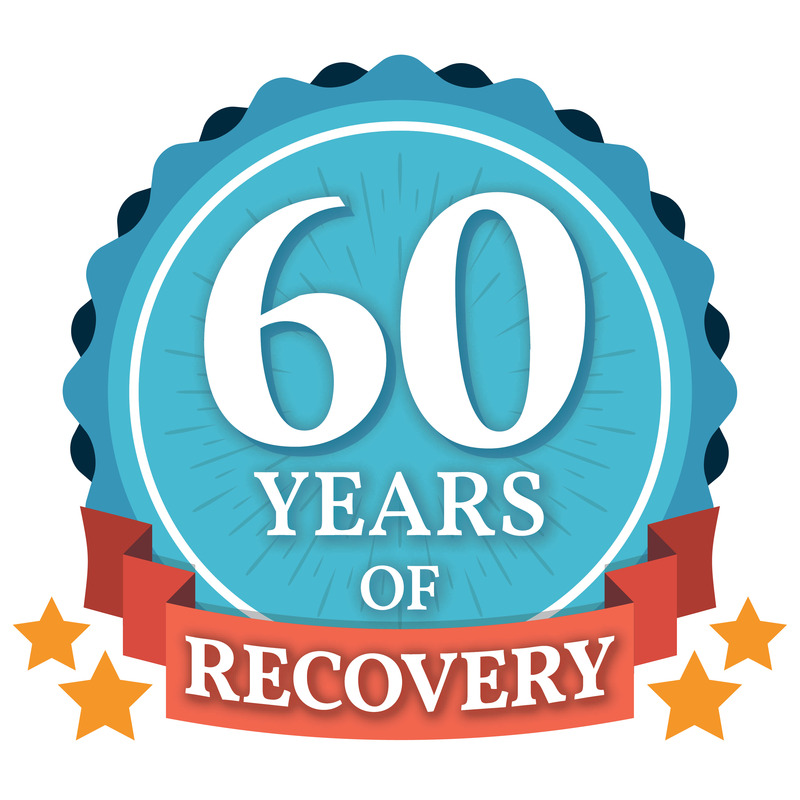 Through individual, person-centered rehab planning, we assist members in setting and achieving recovery and community integration goals. 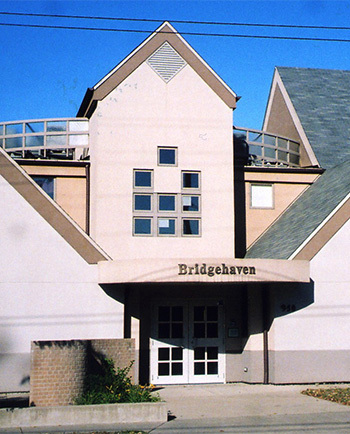 Bridgehaven members may attend as often as six days a week. The fist hit her face, again and again. The little cries, but nobody care. Bruises are there and hunger burns too. The little girl cries, but nobody cares. More bruises are there & she is cold & lonely. Asleep at the hospital so warm and so clean. Still, the little girl cries, but nobody cares. Her mother is leaving. She never returns. Her sisters have gone, her brother too. She dreams of a family but none comes her way. Asleep at the orphanage so warm and so clean. Her dream has come true, or so she thought. Their words are so harsh. Is she really that bad? Their touches are bad. Her innocence is lost. Asleep at her home so warm and so clean. Now an adult with children at hand. But listen real close and you will hear. The little girl still cries. 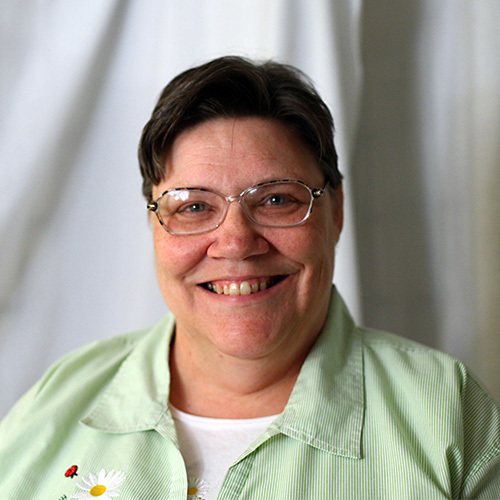 “On January 1st of 1996 I had a job, a new car, and was renting a lovely three bedroom house. By April 1st of that same year I had lost my job, my car, and my lovely house. Because in January of 1996 I was suffering from an illness that had complete control of my life. As a result of the extreme abuse I experienced for the first 17 years of my life, I was severely depressed and suffered from panic & anxiety attacks, post traumatic stress disorder, and disassociative identity disorder. Everyday tasks, such as going to work, going to the store, dealing with my children’s teachers or friends, and even something as simple as talking to my sister on the phone were very difficult for me to do. I finally reached my breaking point, that fateful January, while driving home from Lexington after taking my oldest daughter, Christina, back to school at UK. I was overcome with the urge to drive my car into the rocky hillsides that run along I-64. The only thing that stopped me was the thought that I might hurt or kill someone else in the process. I spent the next eight weeks in the hospital and three more weeks at a crisis center. After almost three months I was stabilized enough to be able to go home. Even though I was able to go home I was still not doing very well. I was very afraid to go anywhere. I was quickly becoming a total shut-in. I knew this was not good for me but didn’t know what I could do about it. A friend of mine was attending Bridgehaven and she used to tell me about the things she did here. Because of the things she told me I felt that Bridgehaven would be a place I could go to learn how to be around other people in a safe and supportive environment. So on September 16th of 1996 I became a member of Bridgehaven and have been attending or working there ever since. Even though I really wanted to be here it was still very hard for me when I first started attending Bridgehaven and it was not unusual to find me hiding under tables at first. But the wonderful thing about Bridgehaven was that it was okay for me to hide under those tables if I needed to. The total acceptance I received was just what I needed. Instead of pretending that things were okay I could finally start working on making things okay. I started attending groups but was never forced to talk. But I found myself talking anyway. I needed to talk! I needed to be heard! After a while I started coming out of my shell. I started giving talks to people who wanted to learn what Bridgehaven was all about. I also did a lot of advocacy work in Frankfort on behalf all disabled people and as a result of this I was given an award and invited to have breakfast with my state legislators. This involved spending the night in a hotel in Frankfort and some of my old fears started to resurface. I had never spent the night in a hotel before. Since Ramona Johnson was also going, she offered to get adjoining rooms and leave the door open in case I panicked. To my great surprise none of this was necessary. Instead of being afraid I actually had a good time. It was at this time that I had what Ramona like to call my epiphany. I discovered that what I had become afraid of was being afraid. I finally realized that I was no longer that frightened little girl. This realization has opened many doors for me. In 2004 I applied for a job at the Kroger near my house. They offered me a job as a cashier but I was afraid I would not be able to do this as I would have to interact with many people. Remembering that wonderful trip to Frankfort I decided to take this job. I then had what I like to call my 2nd epiphany. I discovered that I am a people person! My co-workers just could not understand why I loved my job so much. They just didn’t realize what a miracle it was that I was there. Even though I was able to deal with this job emotionally I couldn’t deal with it physically and to save my poor aching feet I had to move on to another job. I worked at Mercer Transportation making about 100 phone calls each morning. Yet another miracle considering how difficult it was for me to call my own sister on the phone just a few short years ago. I am pleased to tell you that as a result of that job I was able to buy a car and in September of 2007, with the help of Section-8, I closed on my very own home. I am a home owner for the first time in my life! Unfortunately that job ended in March of 2009 due to a lay off. After struggling for 2 years trying to find another job I was trained and certified by the state of Kentucky as a Peer Support Specialist. I am now working at Bridgehaven. This is a dream job for me as I can now give back by helping others on their road to recovery. In addition to returning to work I have also returned to school and in December of 2011 I finally received the Associates Degree I have been working on off and on since 1978. I used to have severe panic attacks at school and it was very difficult for me to continue attending and I dropped out many times just to try again a few years later. I am now going to the University of Louisville part-time and hope to earn my Bachelor’s Degree a few years. As you can see, Bridgehaven took a frightened, depressed, and lonely 40 year old “little girl” and helped turn her into a confident, well-adjusted and happy woman. “If you could see for a moment in your mind’s eye that you are in a warm car just going down the street and you have a hard time seeing outside the car because of the rain. Then you see a person cold and wet just standing in the cold rain. That’s what mental illness is to me. Normal people are out of the cold rain, but people with mental illness are in the cold rain. It started for me when I was five. Just think, one day you’re riding your bike and out of the blue a voice comes from out of nowhere. So this is how it was for voices and me. There was no one around to blame for the voices, so I thought everybody had them. I figured they were normal so I didn’t tell anybody, not even my mom. In spite of the voices, I managed to do my schoolwork and play sports until I got to high school. That’s when the voices got worse. The voices would be with me when I got up early in the morning. I could not study because of the voices. I managed to hide it from my friends, but I discovered that drinking made the voices less troublesome. Soon I just dropped out of high school. Because I quit school, I had to work. So I worked labor jobs dealing with the voices and drinking to cope. Well, the drinking got a lot worse. I became an alcoholic and I was drinking all the time. The voices were still there, but not as bad. In my thirties, around 1992, I lost my last job because of drinking. Being unemployed, I had no money to buy beer. Without the beer I could not sleep and the voices came on like a mad bull. Without the alcohol to slow them down, the voices told me I was stupid and deserved to die. I started seeing visions and I thought people were after me. I was afraid and felt like I had to protect myself from them. One day my mom noticed me carrying around a dry wall hatchet. Even though she did not understand what I was going through, my mom decided it was time to get me some help. I went to Central State Hospital and stayed there about six months. When I left the hospital, I continued to take medicine, but I was still in the dark. I say that it was dark because I did nothing but drink soft drinks and smoke. I did no housework or anything. Nothing seemed to be very important. I had lost a lot of ground. Then the light came on in my life when my outpatient therapist told me about Bridgehaven. It was slow at first because it took me time to trust people. But a worker at Bridgehaven gave me work to do, running the snack shop, and they worked with me on a daily basis. Although it seemed to take forever, the groups, being with other people the same as me and making friends helped me become a different person. The dark was gone. The fear was gone and the light was in my life. The kid was back at full speed. I started doing housework at home helping my mother too. 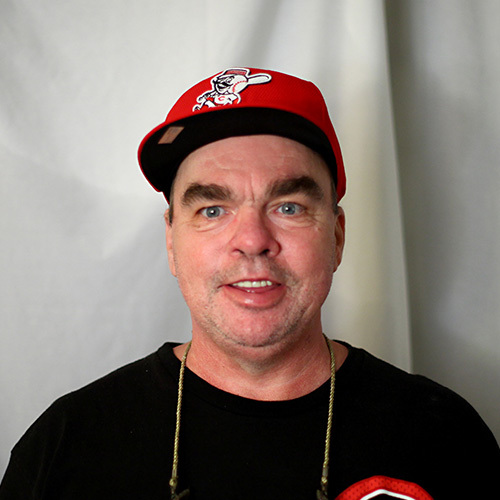 But I didn’t stop with that, with the support I’ve received from Bridgehaven over the years, I’ve earned my GED, met my lovely wife Marianne, and we live in our own apartment! In 2006 I went back to my studies and became certified as a Peer Support Specialist with the State of Kentucky. Several years ago I became an official employee as the first Peer Support Specialist at Bridgehaven… the same place that gave me back my own life.